This post was originally going to update you with a news article from 8th April. But recent events mean I am re-writing it to take account of the latest news to come out of the Project. 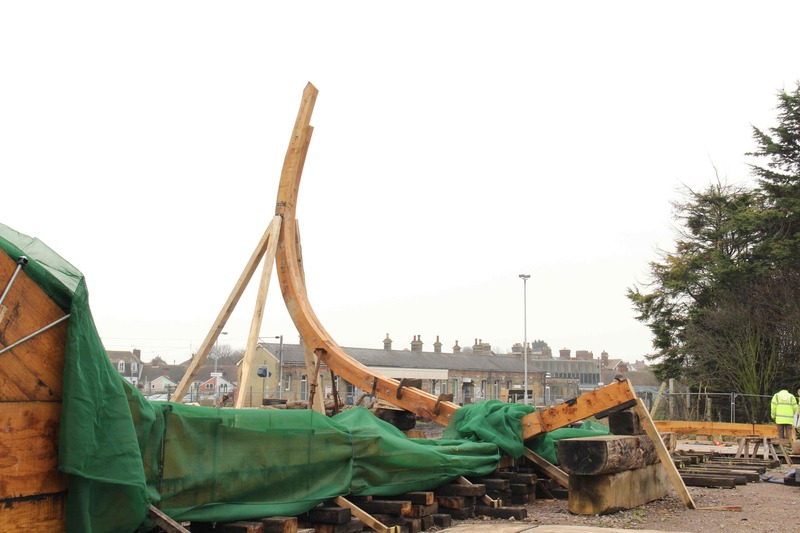 Concerns have been raised there had been a lack of progress at the Harwich Mayflower Project, which aims to build and sail a replica of the Mayflower to the USA in 2020. 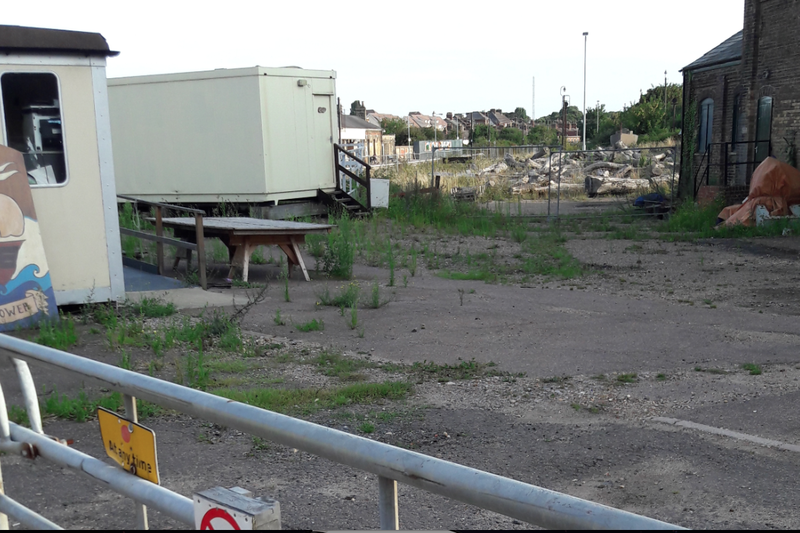 Harwich Town Council heard residents were worried about the lack of visible progress at the project’s yard in George Street. Dr Terry Rogers said he feared the project, which has been running for six years, would not be complete in time for the celebrations. 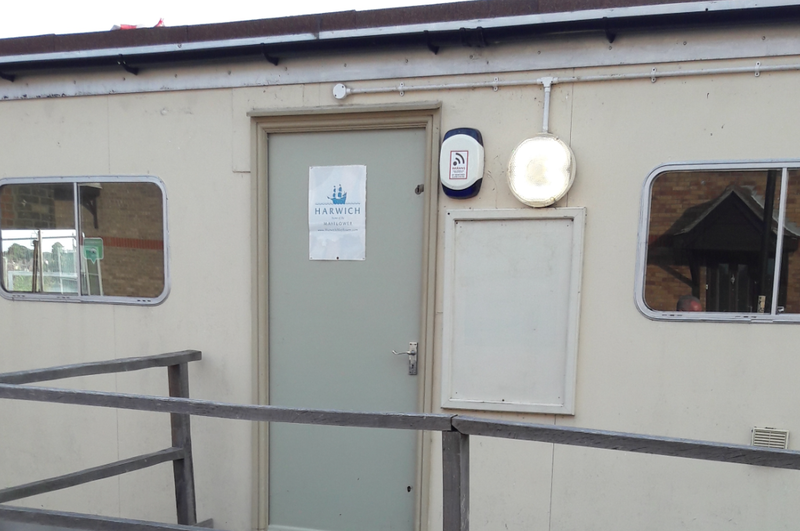 He called on the council and the Harwich and Dovercourt Tourism Group to ensure alternative arrangements were put in place. “I agree that if progress on the Mayflower was real and visible, it could have a major positive impact on tourism in the area,” he said. 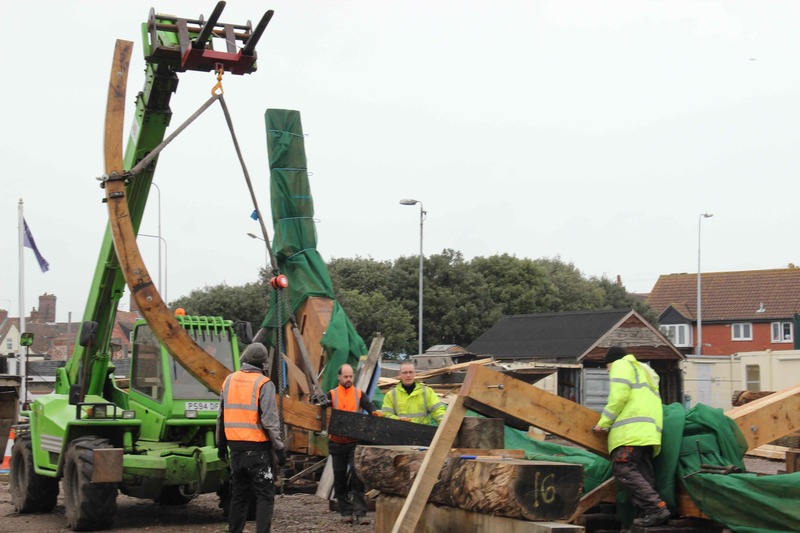 Lynda Chase-Gardener, vice-chairman of the Mayflower Project board of trustees, said the ship would be ready on time. “It’s a two-year build and professionally qualified engineers have confirmed it is a two-year build – so we are on track to sail in 2020,” she said. I’m guessing that this is the same Ms Chase-Gardener that previously said the build would start in January 2016, while still ignoring repeated requests from local residents for information as to why the build has not progressed since 2014 even though donations are still being made and asked for. As there has been no build in the last two years, where have all those donations gone? Harwich Mayflower Centre to close. 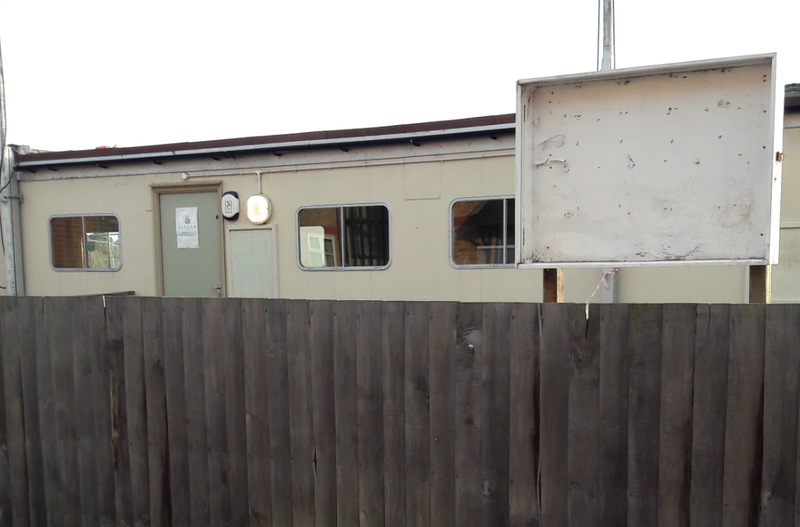 HARWICH Mayflower Project’s training centre is set to close “temporarily” due to a lack of funding. That really is sad, but not unexpected news. While the Project as a whole continues to keep people in the dark, refusing to be transparent with funding and continually taking donations without accounting for them, and refusing to update the build progress, I think we may expect more bad news on the horizon. No surprises there then. Some nice buildings going up though. risk her name and integrity by claiming that “the ship will set sail in 2020”. 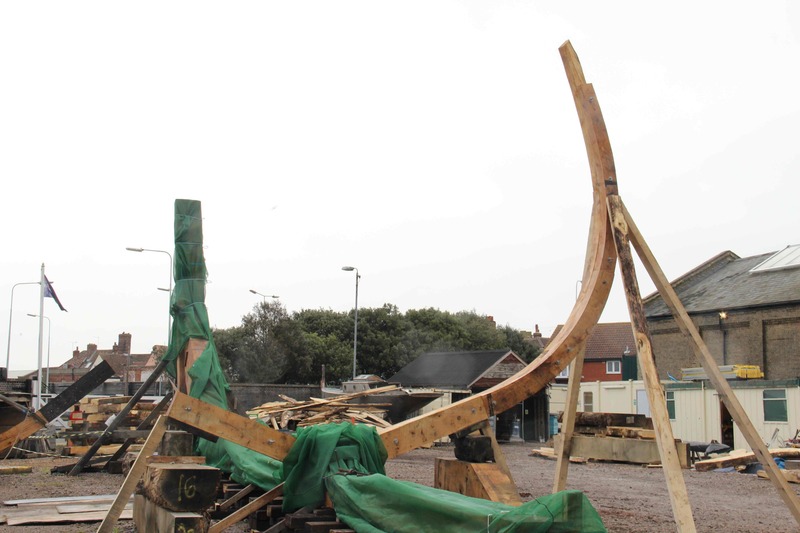 Harwich Town Council seem confident that alternatives to the ship itself would provide a focus for the celebrations. 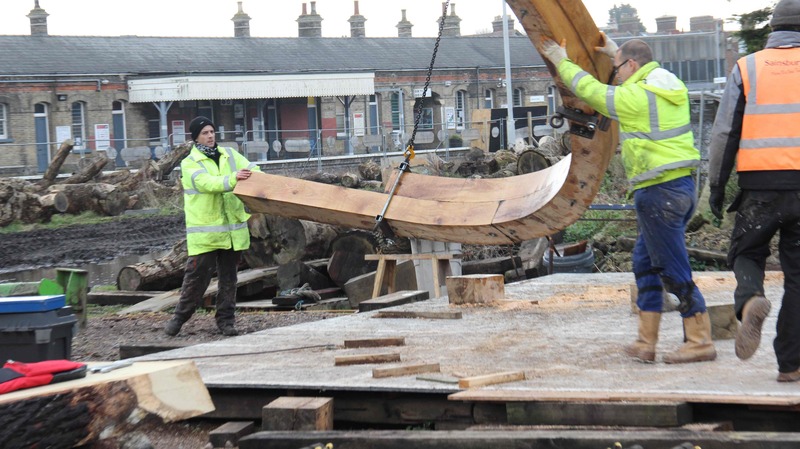 Not quite accepting that the Mayflower Project is crooked, Harwich Town Council officers appear undisturbed by the racket in our midst. I am waiting for a report from accountants with their opinions, and when I have studied that I will finalise the draft I am preparing for the Charity Commission copied to Bernard Jenkin MP. I accept that I too risk my name and integrity by pursuing this course but if we cannot rely on Council officers to intervene then we the public must take a stand. I urge you to join me. As the New Year settles in, I decided to venture down to the Mayflower Project in the hope of getting a few more pictures for you. 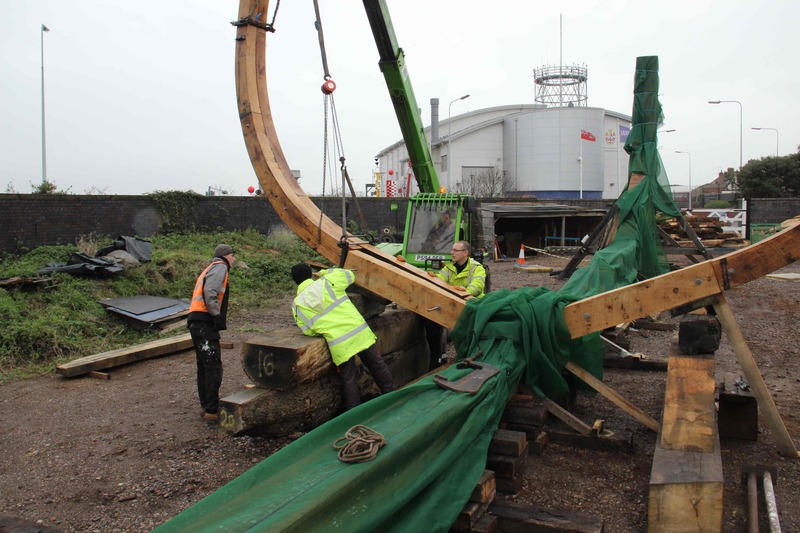 I was lucky enough to arrive as the first of the frames was being lifted into place. 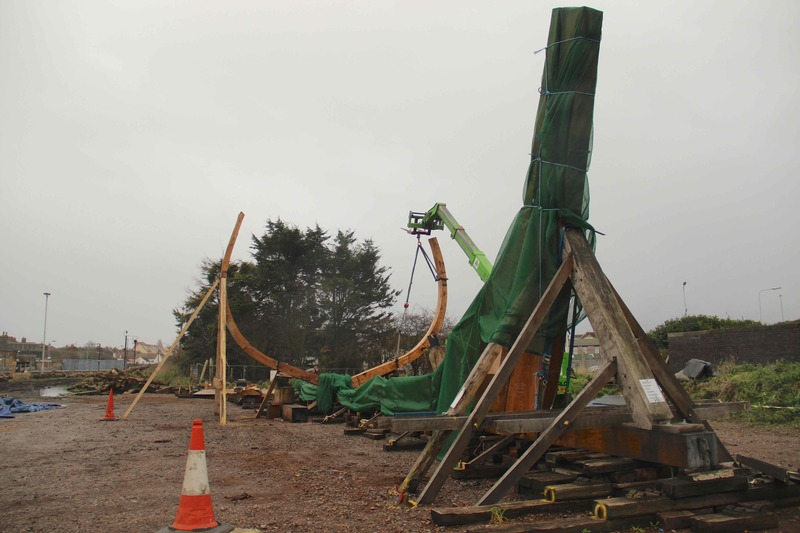 It was a bit of a murky day and as the cloudy skies gave way to rain, the shipwrights worked through it to get the frame up. What immediately struck me as the frame rose above the keel was how small it looked. How did 102 passengers make such a perilous journey in such a small space? Chris Conway, the Mayflower shipwright, was again kind enough to mail me a few words on this stage of the build and this is what he had to say..
“After aborting the lift of Frame 20 before Christmas due to high winds, we have been lucky enough with the weather on our return back to work to have both sides of the main frame up. 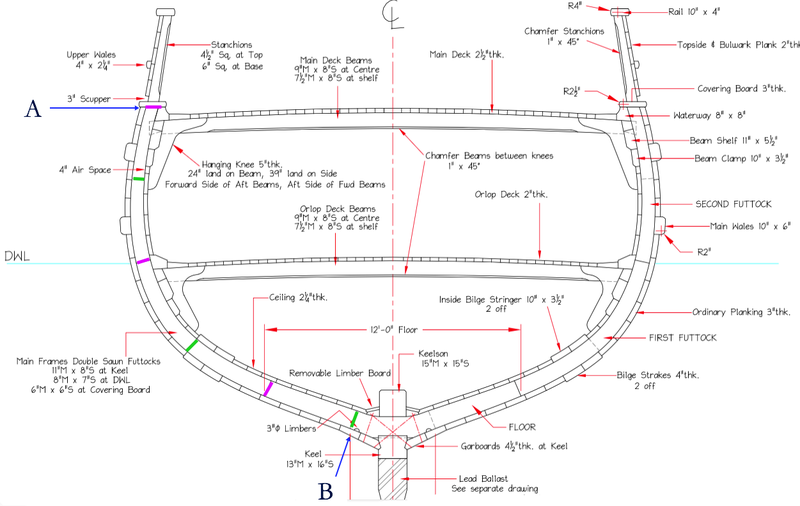 Although the overall weight of each side of the frame only weighed in at around 600kg, we had to ensure that the frame was balanced when it was lifted so that it would line up correctly with the floor (The floor is the ‘y’ shaped base that fits onto the keel and can be seen in earlier posts) that was already temporarily bolted in place before Christmas. We used an “endless fall” to allow us to tweak the angle of the frame so we could fit the two bolts into the holes that had already been drilled on the framing floor. 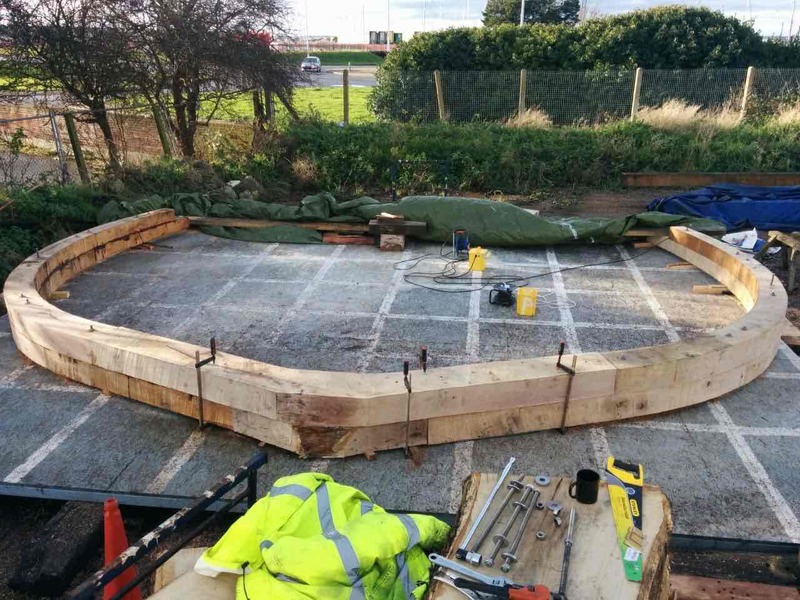 As mentioned in an earlier post this frame has only been placed in situ on a temporary basis, but it has been a worthwhile exercise on how we go about cutting and fitting the frames in future. As with all posts, any image can be clicked on to enlarge it. 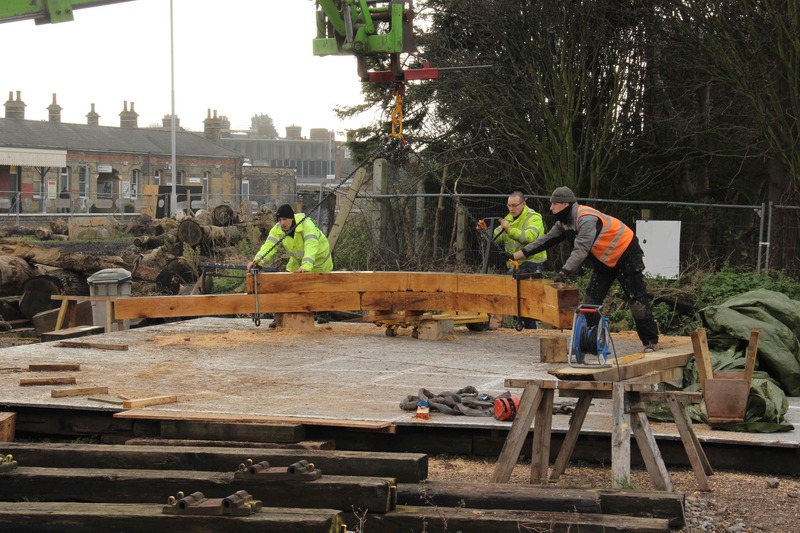 I’ve been horrendously busy for a little while, so I’ve been unable to get to the Mayflower Project to follow the build for the last few weeks. Fortunately, the Mayflower shipwright, Chris Conway, took pictures in my absence and I’m putting them up here for you. 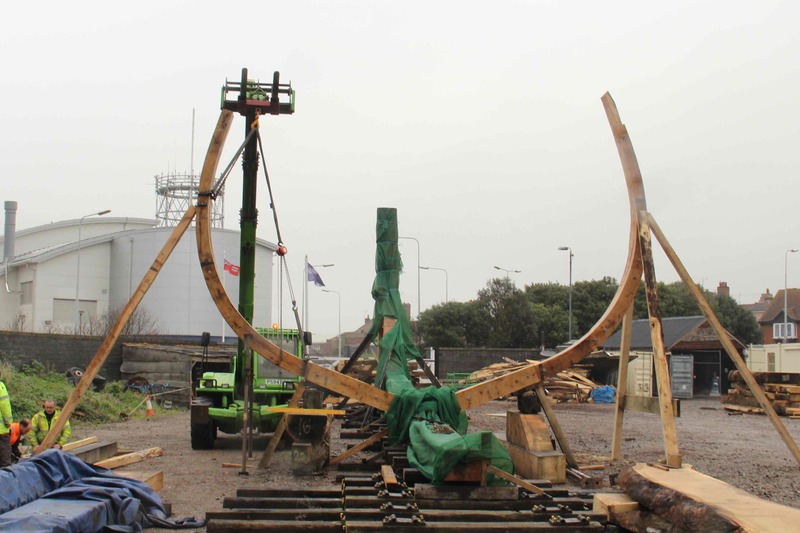 Things are moving swiftly at the project and it looks like we may see the first frame (rib) up by Christmas! 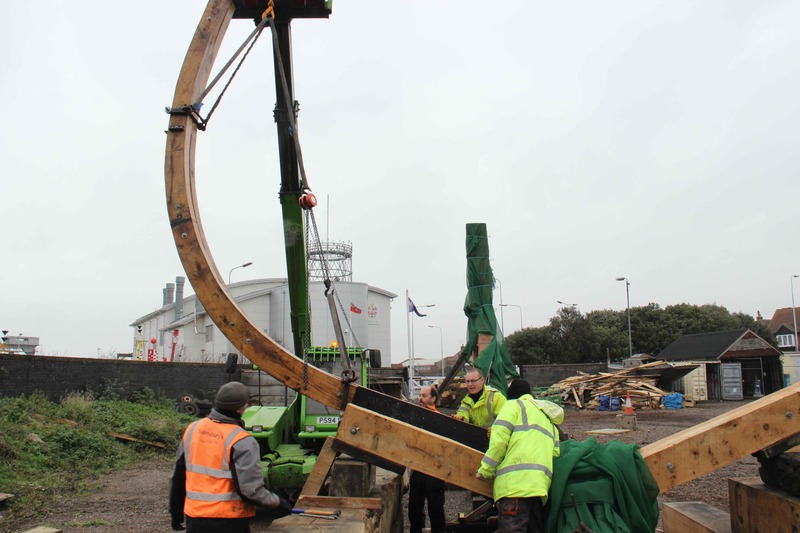 The Project recently received a consignment of timber and frame 20 has now been completed. As I wasn’t around for either of these events and I don’t really know the difference between a futtock and a haddock, (although I suppose the smell might be a bit of a giveaway), I asked Chris if he would write a few words for you about the Grimsby wood and Frame 20. Some of the pictures below are mine and some were taken by others, but the words are all by Chris. 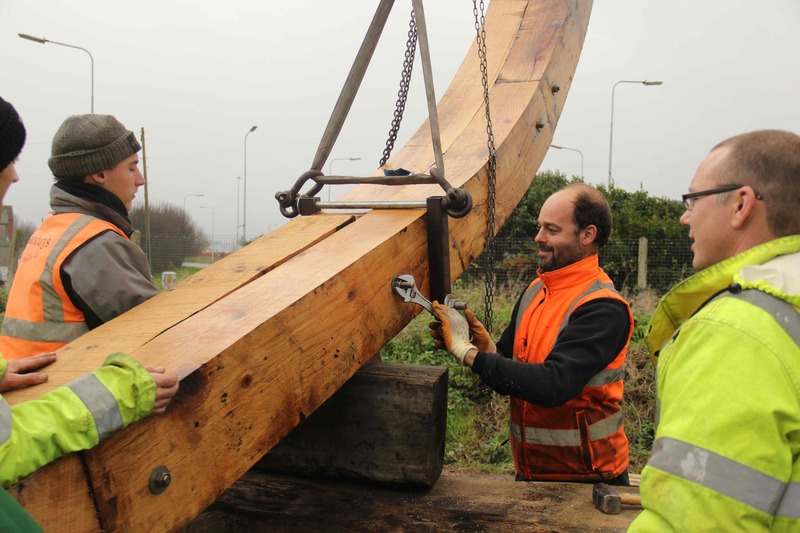 Yep, you actually get to hear from the Shipwright building the Mayflower! 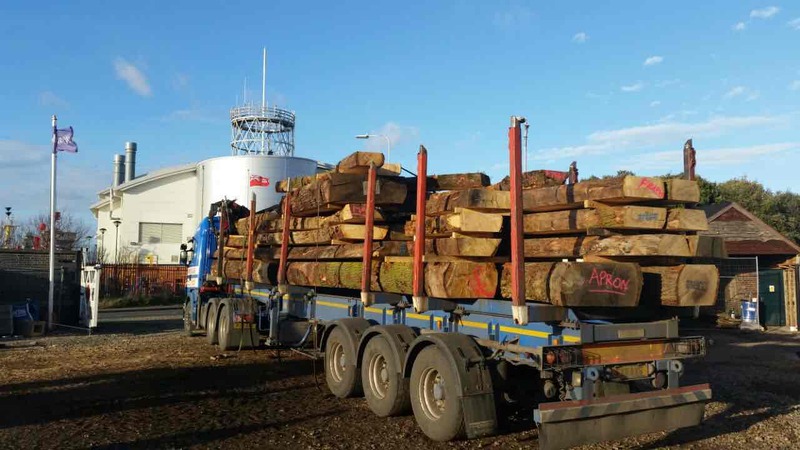 OK Chris, Over to you……..
We have just received a delivery of English Oak from a Timber Merchant in Grimsby, this timber has been selected for the front part of the Ship’s backbone which includes the stem, and forward sections of the keel. We also have around six of the main floors and chocks that will be used for the main frames and a number of futtocks to make up two frames. 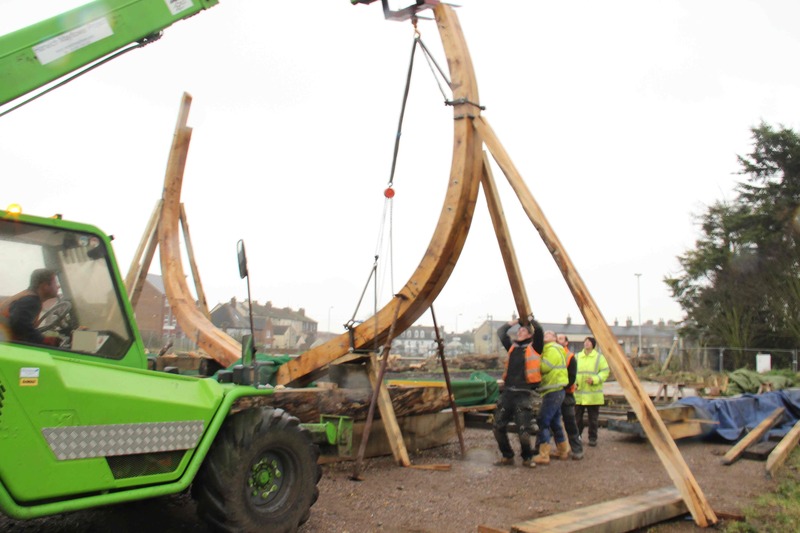 Each frame is made up of smaller parts called futtocks and these are attached to the floor timber which spans across the keel, ideally timber is chosen so that the grain runs true to the curved shape of each futtock. 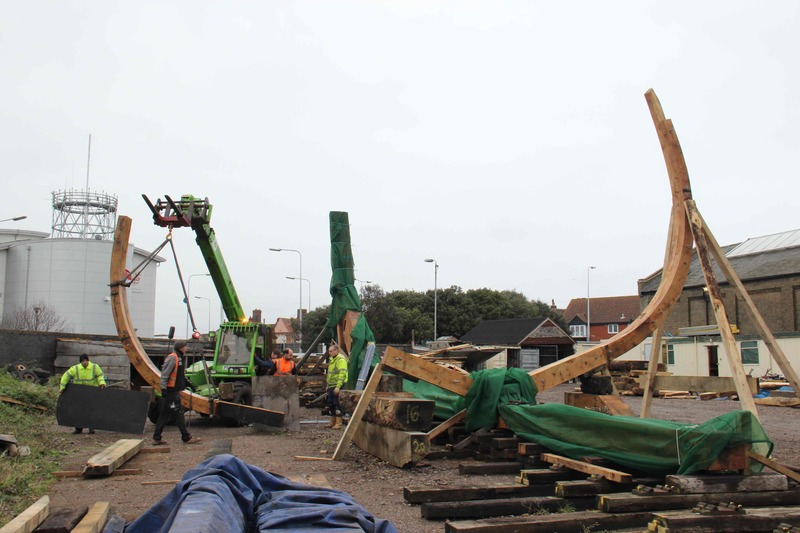 Although we have some logs in the yard these are not suitable for the amidships frames as the curvature is too shallow and therefore not suitable, but hopefully they will be used for the forward frames which don’t require as much curvature. 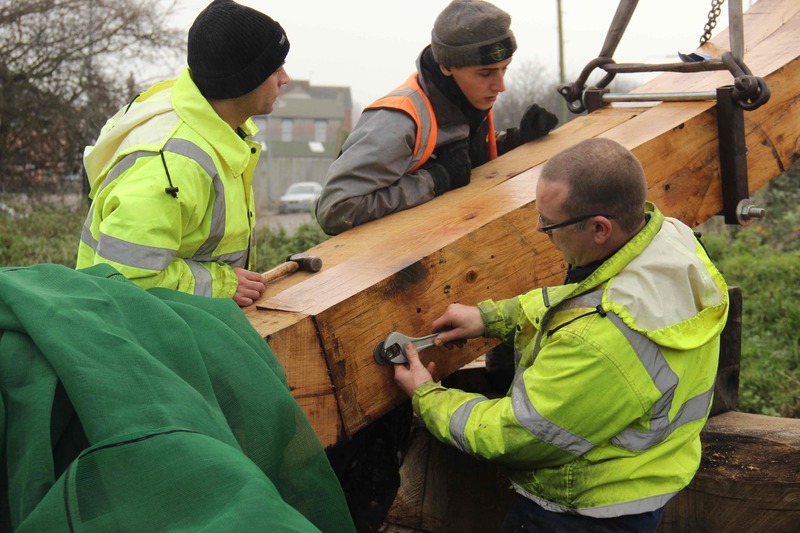 One of the benefits of buying in timber from a timber merchant is that it has already been selected for us using patterns taken from the loft floor and milled to the correct sided dimension, ready for us to cut out the correct shape. 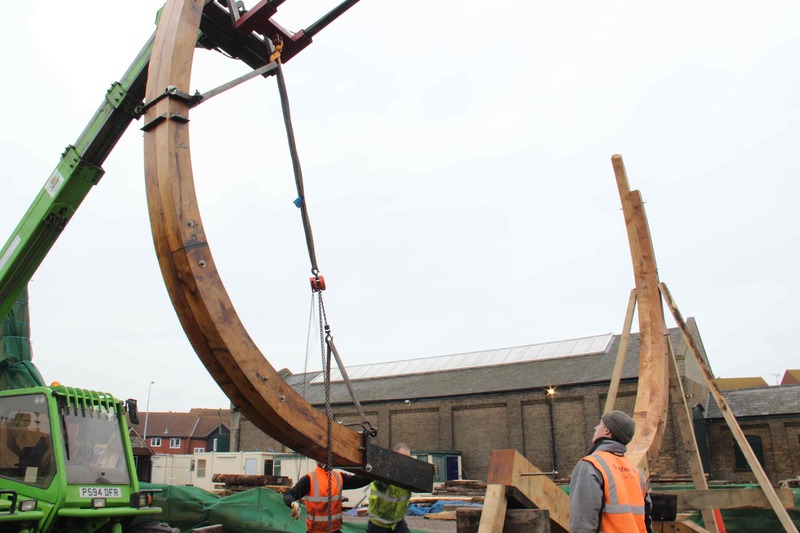 We are now in the process of raising the first frame, which although wouldn’t usually happen at this stage of the build, we wanted to see how we would go about cutting each piece and work out a system to put them together and lift one in place. It also gives the visitors a visual idea of the size of the ship. 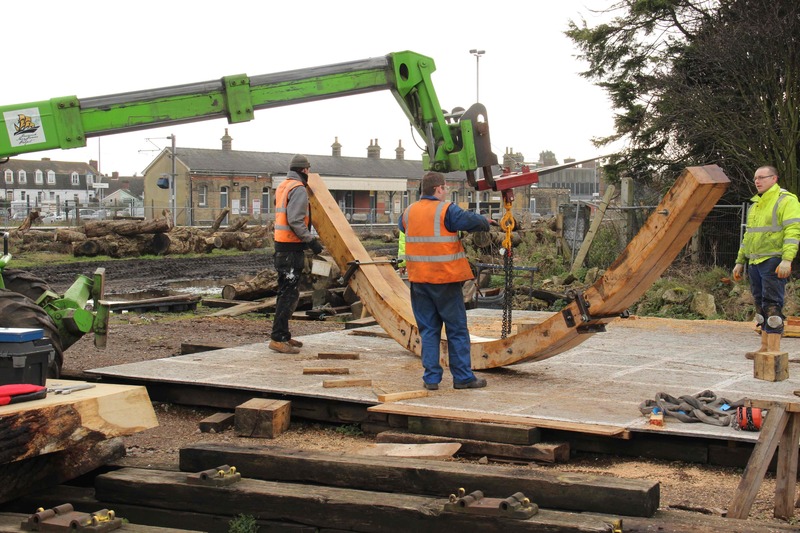 This frame will be carefully blocked and shored up and will not be finally fitted until the backbone is finished and suitable datum lines established. 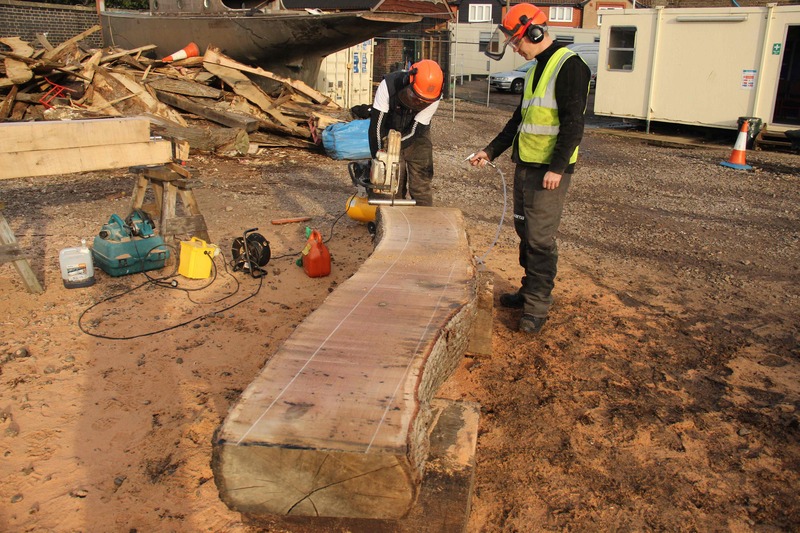 We have cut each futtock using a chainsaw with a modified bar with rollers that allows us to scroll round each curved line, this has proven very successful and could possibly be the way we cut all the frame sections. 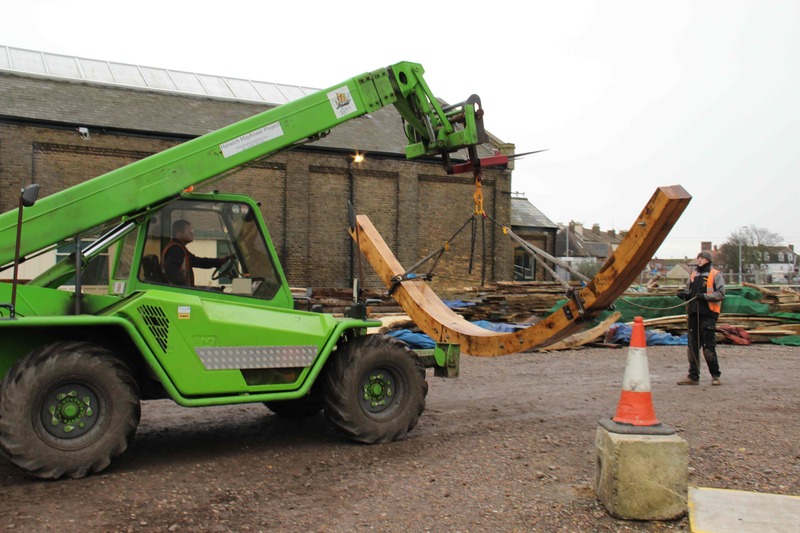 Our other option is to use the very old tilting bed bandsaw that we have in the yard, but this requires a significant amount of work to be done to get it in an operational condition which we are trying to raise funds for. Content: James Kelly. Photography: James Kelly (truck courtesy of HMP). Content: James Kelly/Chris Conway.